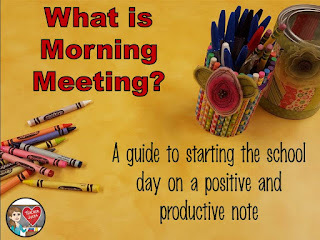 In 5th Grade with Teacher Julia: What is Morning Meeting? On most mornings, you could walk into my 5th grade classroom at the very start of the school day and see the students working quietly at their Chromebooks or in a journal. They are focused and dialed-in for the day. This takes practice and structure, but it is possible for any classroom to begin the school day in a positive and productive manner. This is the start to what makes our Morning Meetings run smoothly and stay organized every day. Hand in their homework into the "Homework Bin"
Morning Meeting is something that our school has adapted from the book Teaching Children to Care by Ruth Charney which explores The Responsive Classroom approach to building a caring classroom environment. This is a moment at the very beginning of the day that allows the me and students to build a relationship, review plans for the day as well as set a tone for the classroom. I start my Morning Meetings by reviewing the schedule for the day. Kids are always curious about what to expect and I like to start with that in order to alleviate any anxiety or preoccupation with what to expect. This way, everyone can focus on what we really need to do which is have a meaningful and productive class discussion. Beautiful things can happen during a well-structured and thoughtful Morning Meeting, so I like to get as much out of it as I can. This is when I teach life skills that will guide my students in and outside of the classroom. It is a chance for them to explore their feelings and attitudes towards a variety of topics. It is also the perfect opportunity to discuss controversial subjects in which they might not normally explore points of views other than their own. Before students arrive, I choose a quote or a thought-provoking question and I write it on the board. In my classroom, this is their first experience with Chromebooks, so the excitement to write is already there as well as the feeling of privilege which I go in-depth with them about at the start of the year. I think this definitely helps set the stage for expectations, but I have also been super successful with this activity using Personal Journals (a composition book that students and I communicate privately with). "An injustice anywhere is a threat to justice everywhere." - Dr. Martin Luther King, Jr.
Why is it important to advocate for people who are being treated unkindly behind their backs? As I am sure you can see, these types of quotes and questions mostly deal with character development and I think do a great job of setting the students up for a positive day of learning. A lot of the quotes came from the book 365 Days of Wonder by RJ Palacio. A great companion to her first book, Wonder. While students are responding in their Chromebook or journals, this is another great moment in the day when I can meet with anyone who might have needed help with homework or just to check in with me about something. It can also be a great time to go through and check homework completion or walk around the room and observe the students (which I recommend doing only that the first 2-3 months of school, in order to ensure that the rules are being followed and that everyone is responding thoughtfully). At some point, it is important to read through a few email responses or journal responses, if not all of them before starting the Morning Meeting. This will help if you end up having a discussion that no one is contributing to. I give students a five minute warning and then a 2 minute warning before I ask for everyone to come to the carpet in a circle. This is when I review the schedule for the day, answer any questions about our day or a project that they are working on at home, etc. Then I ask the students to discuss the quote or question. If no one is speaking up or responding to those who are sharing, I suggest for the teacher to refer to what was read from the responses. For example, I might say, "I noticed a few of you made connections to this quote with Willow from our read aloud, Counting by 7s. John, what sort of connection did you write about? How does that relate to this conversation?" One very important reminder for teachers during Morning Meeting is to HOLD OFF ON GIVING YOUR OPINION OR INSIGHT, for just a little while if not for the entire conversation! As much as we want to steer the children into the direction we believe makes the most sense or is the "right way" to think, it is very important that we allow children to find their own voice and opinion among each other. The only influence any student should be experiencing at this moment is the influence of their peers' contribution. This is probably the most challenging part as a teacher, but again, the most important! I am not going to lie though, I have done it a few times, but in a way that I think is constructive and is challenging not "steering". Most of the time though, I will wait until the conversation is almost through. I will ask a student a question to stretch their brain and get them thinking just a little deeper or consider something new. I like to tell them that I do not hold an opinion on the subject necessarily, though they tend to know where my opinion lies based on knowing my personality. Other times, I tend to say that I am playing "Devil's Advocate" or want them to think fron another perspective. However, again, I try my hardest to keep my mouth shut until it is towards the end of the conversation. Teachers need to be strategic in the questions they ask as to make sure they are challenging the students with critical thinking and not degrading them or questioning them in a way that makes the child feel bad or like he or she may have misspoke. I tell my students that this is a moment in the day where we are respectful of each other and listen to each other so that we can have a productive, whole class conversation. We listen in order to be able to respond - It isn't always about being heard. Depending on the classroom dynamic, this can either take a lot of practice with direct instruction on how to have a class conversation, or it can be something that the students easily develop into with your guidance. Morning Meeting has allowed me to really see my students' social growth throughout the school year. I get to hear how they "put into action" the things we discuss and the values they hold dear, which incidentally are the values we teach them starting at a very early age at my school. There are many times throughout the school year where I will leave the carpet after a conversation feeling like I just got through to these kids in a way that would never be possible without this type of setting and environment. How else could we discuss the importance of advocating for someone who might not even be in the room and how that shows the people beside you that you can be a good friend? And how very important that is for middle school or life in general? Or that living the best version of yourself can inspire others to do the same and how cool it is that we have the power to influence those around us with our actions? So many deep conversations have taken place on this carpet in my classroom that I get butterflies when I think about it! By the end of the school year, I have students articulating their passion for the beliefs they hold close to their hearts and that they truly feel are important to practice in their daily lives. How much better of an education can they get? !